It’s official. The award season is here. YAY!!! I am currently jumping up and down I’m so giddy. This is my favorite time of the year when the movies are good, the celebrities are tolerable and the classiest actors arrive on scene. The first televised award show nominations have been announced. They are the Independent Spirit Awards, given solely to the independent filmmakers of the world, not the big budget studio productions. These are the movies that filmmakers had to work extra hard to have their vision become reality. Criteria for the Independent Spirit Awards, in the words of Film Independent: “Original, provocative subject matter; Uniqueness of vision; Economy of means with particular attention paid to total budget and individual compensation; and Percentage of independent financing.” Films must have received a week-long commercial theatrical release or must have screened at festivals including the Los Angeles Film Festival, New Directors/New Films, New York, Sundance, Telluride, or Toronto. The group also recently announced a maximum budget cap of $20 million for nominees. 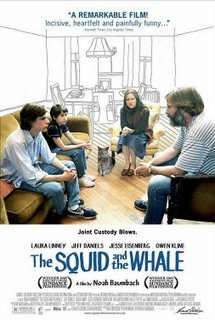 The Squid and the Whale directed by Noah Baumbach, starring Jeff Daniels and Laura Linney leads the pack with six nominations. Four other films, Capote, Brokeback Mountain, Good Night, and Good Luck, and The Three Burials of Melquiadas Estrada, received four nomination. 200 movies were presented to the Film Independent for consideration. The awards will be presented on March 4, 2006, the day before the Academy Awards. Robert Elswit, Good Night, and Good Luck. Read my reviews of Crash, Me and You and Everyone We Know, Good Night, and Good Luck and Capote. I will have to bow out having seen none of these movies. Lackwanna Blues is centred around an African community and the pivotal role played by the owner of a boarding house(merkerson)The story is told by the child to whom she became the mother.Her love and interest for the wellbeing of all she comes in contact with is the dominant theme. I’ve seen only three, “Good Night and Good Luck”, “Crash”, and “Me and You and Everyone We know”. Except for a few docs. and foreign films, I’ve heard of every film nominated. In fact, from what I’ve read none of these nominations surprise me at all. Don’t worry about not seeing any of the films. If I were you I would go see “Good Night and Good Luck”…immediately! It is by far one of the best movies I have seen in a while. Ever since the EMMY’s I’ve been intrigied by “Lackawanna Blues” Any info on what it is about? sounds interesting. I’ll be sure to check it out.